What does the high school of the future look like? It’s one that emphasizes useful, relevant skills that can be applied to college and the work world beyond. One that encourages students to be critical thinkers, responsible for their own actions. One that trains them to work collaboratively and push themselves to outside their comfort zones. And one that uses the benefits of technology to reach those goals. If these are the tenets, then the folks at Napa New Technology High School in Napa, Calif., believe theirs is the model. One of 62 schools in the New Tech Network, Napa New Tech High has turned the traditional high school model on its ear. Its objective is to deliver responsible citizens who are ready to work or go to college, and learn the skills to be prepared for the world outside the confines of school. I visited the campus recently and came away with a clear understanding of the school’s vision. There’s a lot to cover, but in essence, I’ve boiled it down to these five ways I consider New Tech a school of the future. 1) Breeding a culture of accountability. Aligning with the growing movement of teaching 21st century skills, one of the recurring mantras at New Tech High is the pervasive culture of respect, trust, and responsibility that goes both ways between educators and students. For instance, you’ll hear no bells signaling the end of class periods. Students are trusted to keep track of their own time, just as they would as grownups in the outside world, and to show up where they need to at the appropriate times. They can organize independent study projects with teachers and work on their own or in groups in the school’s airy atrium/cyber café. When, for example, it came time to nail down a policy about video games – whether non-educational games should be allowed on school computers or only on personal computers, whether headphones should be required, whether some games should be barred completely at school – administrators included students in the decision-making process. “Rather than come up with rules to control behavior, we give them as much freedom as possible, but give them norms and behaviors for work we want everyone to do. It’s the idea of ownership of community,” Curtis said. Put simply, project-based curriculum emphasizes learning through doing classroom projects that address a specific issue or challenge. Students typically carry out the projects in groups, and teachers guide them along. 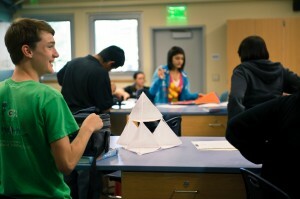 At Napa New Tech, you’ll hear very little lecturing and see few teacher-led activities. For this school, the decision to use project-based curriculum was based not only on what topics students should learn, but also what skills they should acquire in school. 3) Smart use of technology. You can’t escape computers at Napa New Tech High. They’re everywhere. 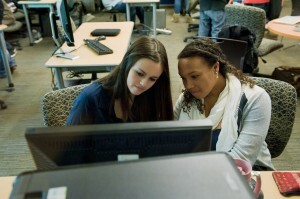 Students sit grouped together at round or long conference tables, working in teams, each one armed with a computer. The point, though, is not that they have these computers, but how it helps them become self-sufficient learners. To that end, every student has access to a computer, whether it’s brought from home or provided by the school, whether it’s a Netbook or a desktop. For those families who can’t provide laptops for students, the school offers desktops. But according to Curtis, 93% of students bring their own laptops, though 33% are on free or reduced lunch. 4) Test scores based on more than knowing just facts. In most schools, if a student turns in a project or paper late, her entire grade is typically lowered. And as a result, that one grade doesn’t accurately indicate other important factors, such as quality of work or amount of effort. With New Tech’s “gradebook” system, a student is graded on four different criteria: content, written communication (even in subjects like math), critical thinking, and work ethic. And sometimes to surprising results. Every student has access to how they scored in the rubric, and can easily identify what part of their project can be improved. 5) Providing a framework for other schools to scale. You’ll find pockets of innovation all across the country, examples of progressive schools or programs that could be replicated, but often are not for a long list of reasons. But New Tech Network is scaling its program all over the country. 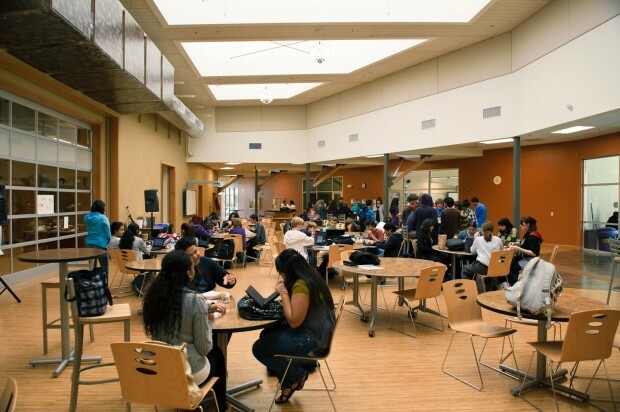 Napa New Tech High is the first of a proliferating network of schools that follow the same ideals and mission. As of now, 62 schools across the country are replicating the New Tech model (and that number grows). What does it take to become a New Tech school? First and foremost, it's the willingness to embrace absolute change in school culture. “If you don’t have this atmosphere, it’s hard to think about academic achievement. Even in urban schools, we focus on culture as the primary piece, because until that gets established it’s hard to do anything else,” said Chris Walsh, director of innovation and design at New Tech Network, which is a subsidiary of KnowledgeWorks Foundation. Also, it takes many months of planning, about $450,000 to $500,000, a lot of intense teacher re-training, an entire project-based curriculum, and possibly the biggest challenge -- an understanding that the model has to be embraced in its entirety. And they're pushing for even further growth. To really get traction and for communities to benefit from all the advantages of New Tech schools, the network’s goal is to create entire districts with their model.